Fisheries and Oceans Canada just increased the daily limit for Halibut coast-wide from September 1st to December 31st, 2014. The DFO and Sport Fishing Advisory Board (SFAB) Halibut Committee meets monthly throughout the season to review estimated catches. At the most recent meeting, it was determined that the recreational fishery harvest to July 31, 2014 was approx. 575,735 pounds of the recreational fishery’s Total Allowable Catch of 1,057,500 pounds. Effective September 1 through to December 31, the daily limit will be increased from 1 fish per day to two fish per day. All other management measures as noted in Fishery Notice 0076 remain in effect. The maximum length for halibut is 133cm. The daily limit for halibut is two (2). 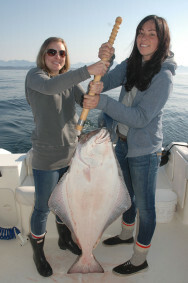 The possession limit for halibut is two (2), only one of which may be greater than 90cm in length. There is an annual limit of six (6) halibut (per licence holder) as authorized under the 2014/2015 Tidal Waters Sport Fishing Licence. All halibut retained by the licence holder shall be immediately recorded in ink on the 2014-2015 Tidal Waters Sport Fishing Licence. The area from which each halibut is caught and its length shall immediately be recorded on license. No person shall fish for or retain halibut, rockfish and lingcod in Area 121 outside the 12 nautical mile limit seaward of a line that begins at 48 degrees 34.000 minutes North latitude and 125 degrees 17.386 minutes West longitude and continues south easterly at a bearing of 116 degrees True to a point at 48 degrees 28.327 minutes North latitude and 125 degrees 01.687 minutes West longitude. A reminder to recreational harvesters, that the waters of Swiftsure Bank, inside a line from 48°34.00’N and 125°06.00’W, thence to 48°34.00’N and 124° 54.20’W, thence to 48°29.62’N and 124°43.40’W, thence following the International Boundary between Canada and the U.S. to 48°29.55’N and 124°56.20’W, thence in a straight line to the point of commencement, are closed to all finfish, all year. Non–residents of Canada wishing to fish for and retain halibut in Management Areas 121, 23 and 123 must purchase an electronic licence through a Canadian vendor. For more information please contact Fisheries and Oceans Canada.